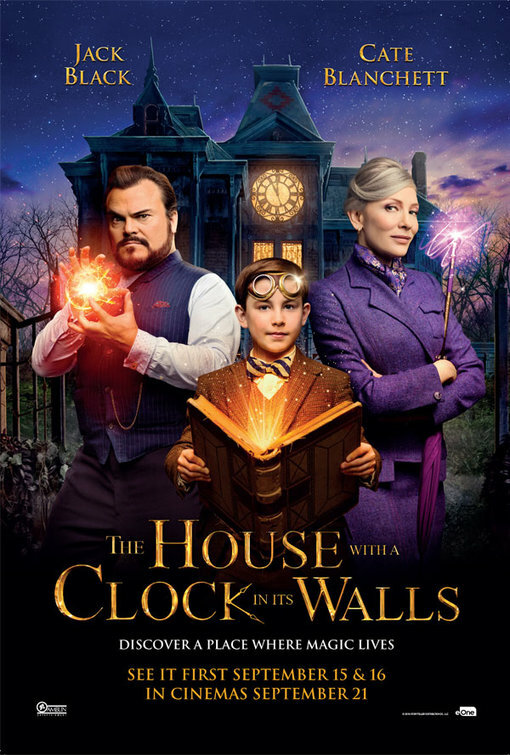 Orphan Lewis (Owen Vaccaro) moves in with his uncle Jonathan (Jack Black) who he discovers is a warlock, and in his house there’s a mysterious clock with unknown powers they must find. When I saw the trailer for The House with a Clock in Its Walls it reminded me of Jumanji (1995) of all things. And after seeing the film I’ll stand by that gut reaction. It’s got the same blend of adventure, scares and great characters and it’s overall just as charming. The House with a Clock in Its Walls is set in 1955 and that 50s aesthetic is a big part of the films charm. The house is eerie with parts of it coming alive – the house is its own character really and that makes sense as such a large part of the film takes place within its walls. It’s a weird and wonderful place, but there’s also a darkness to it too. Jonathan’s next-door neighbour Florence (Cate Blanchett) is witch, and a powerful one too, but her powers have been unpredictable for a while. Blanchett and Black are a surprising but great comic duo, they quickly fire barbs at one another, but you can tell that it’s a form of affection for them and they have a deep friendship. The House with a Clock in Its Walls has surprising number of layers, I teared up a couple of times during this film, and it’s got some great messages about not being afraid of being different. Plus, there’s some unexpected serious moments about the affects of war and these are woven into the story so well that none of it ever feels preachy. The House with a Clock in Its Walls is an unexpected delight. It’s funny, charming and has some child-friendly scares. All those elements are so well balanced it makes it feel like an old-fashioned family adventure in the vein of Jumanji, Hook or Who Framed Roger Rabbit. It’s a really great time. 4/5. Thanks! It’s proper old-fashioned family fun – which makes me sound older than I am but it’s true!